This is my favorite baked ham recipe! 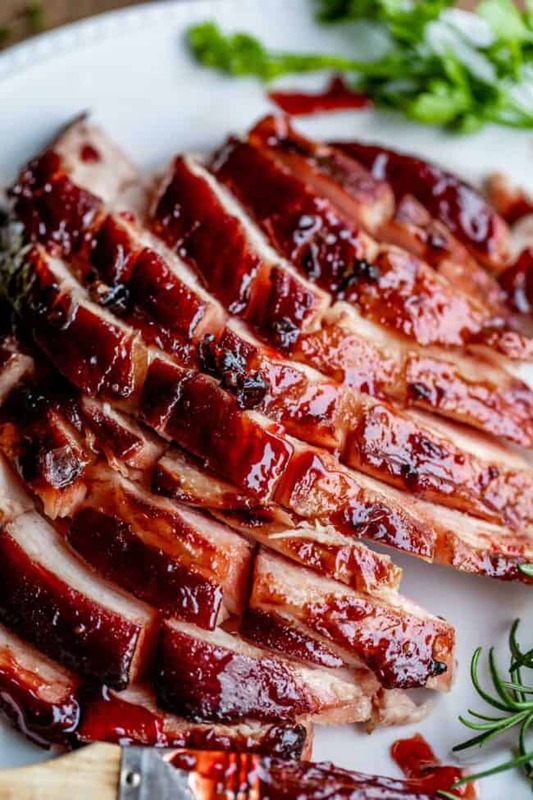 It’s so easy to put together, and the Raspberry Chipotle Ham Glaze (made with raspberry preserves) is the perfect combo of sweet and tart, with a bit of a smokey kick from the chipotle. It not only makes a super juicy, tender ham, but the leftovers are AMAZING when added to soup or a pot of beans. 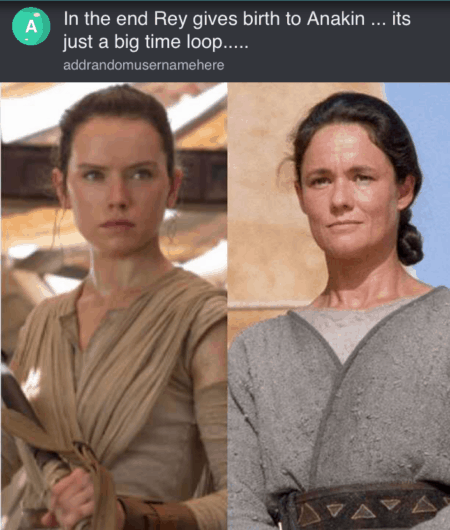 Are you guys Star Wars fans? I’d give myself maybe like a solid B- in my enthusiasm for Star Wars in general. Mainly because if we’re grading on a bell curve, well let’s be real, there are some pretty legit Star Wars freaks out there, so there’s no way I could be considered anything more than a moderate fan. And that’s even coming from a family that bought original Millennium Falcon toys in the 70s, collected all the Taco Bell figurines when Episode I came out, displayed a 10 foot painting of the Death Star on one of the bedroom ceilings, and I’m pretty sure there is still a life-size Chewbacca cut-out tucked away in that same bedroom in my parents house to this day. Well even if we can’t all appreciate Star Wars, I’m pretty sure we can all appreciate a nice and juicy oven roasted ham! 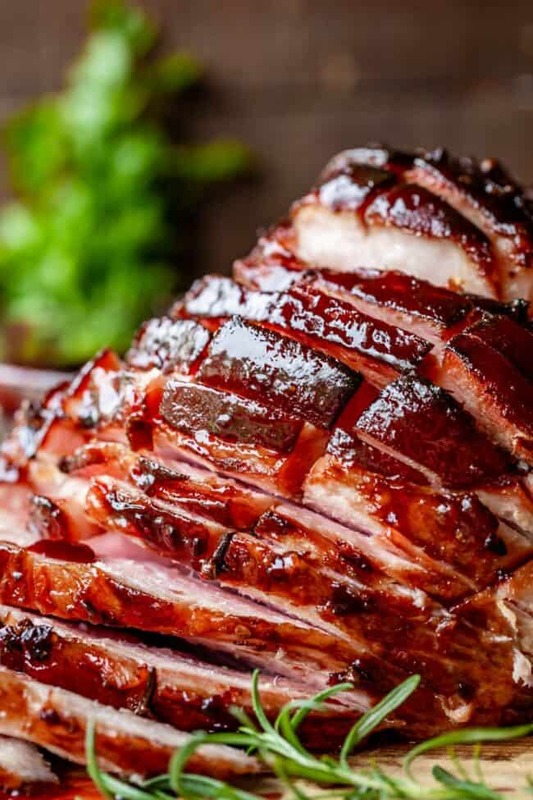 If you have not picked your ham recipe for Easter Sunday yet, PICK THIS ONE!! 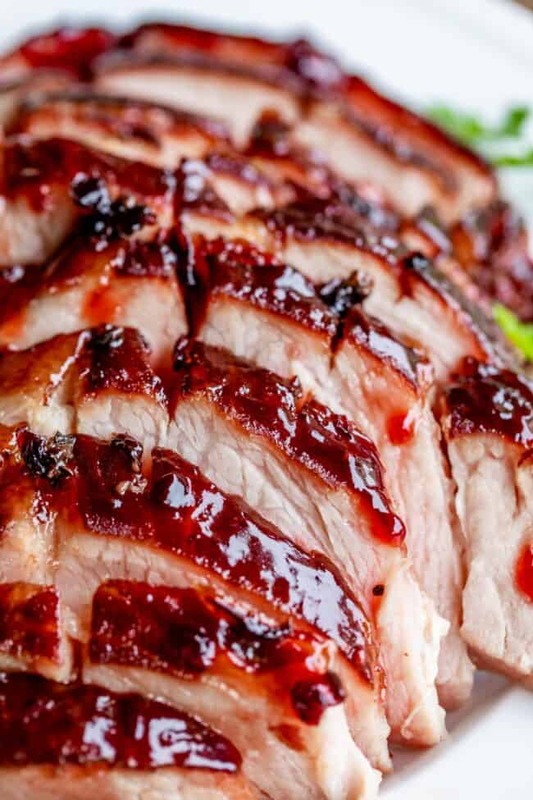 Sorry I’m yelling, but I have strong feelings about this Raspberry Chipotle Glazed Ham. It was one of the first hams I ever made on my own, and clearly it made a lasting impression. The recipe is from The Better Homes and Garden’s Cookbook, it’s one of the “alternate flavors” where they add a little tiny extra paragraph that is an entire different recipe than the ham featured in the picture. I love digging into those tiny paragraphs. Because sometimes you come up with a glaze like this!! I think it was the same day I made Oven Roasted Asparagus with Balsamic Browned Butter, another post that I recently updated. And also the day I made and shot these Heavenly Mashed Potatoes, which are really quite delicious, but have since been replaced in my regular rotation with Aunt Shirley’s Famous Creamy Mashed Potatoes, which are even creamier. 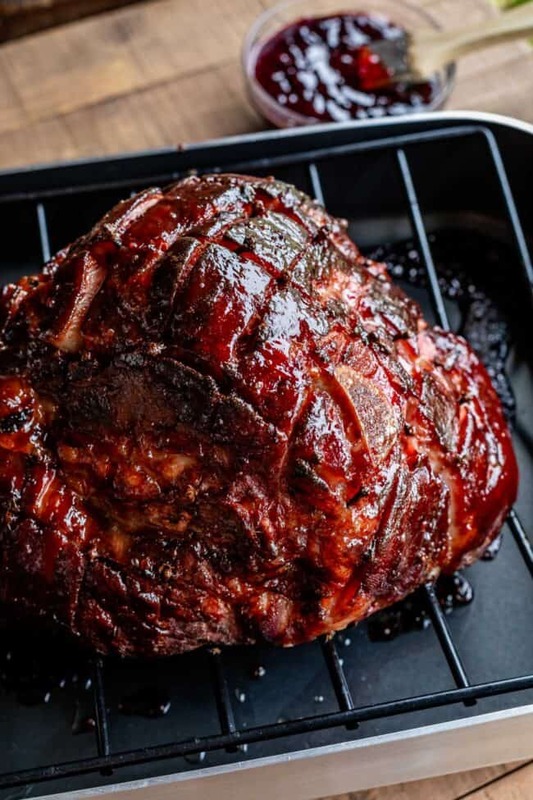 Baked ham is ridiculously easy to make. It is already pre-cooked (smoked) when you buy it. 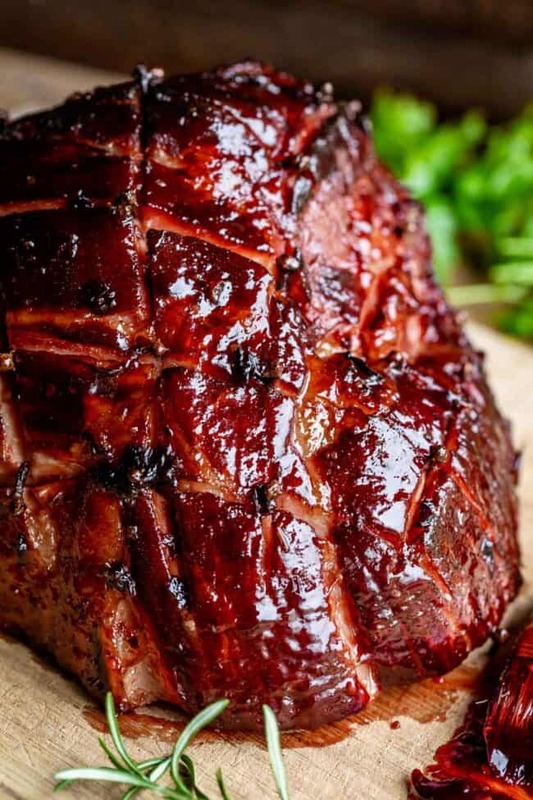 Smoked ham is so flavorful! For this recipe you want to get a rump half or shank portion. You can buy a spiral-cut one, or slice it yourself. (I sliced the one you see in the photos myself.) It’s not hard to do. I like to score my ham with a diamond pattern and stud with cloves. It’s totally optional! I love the earthy flavor it adds. 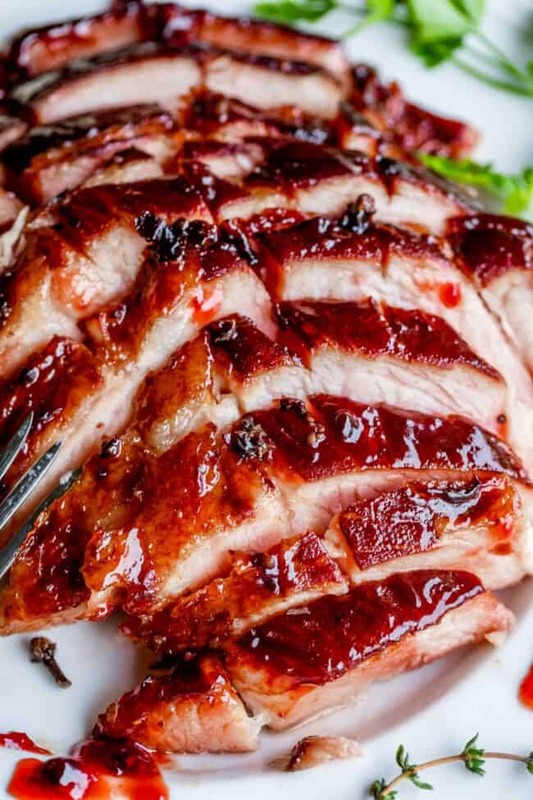 Then all you have to do is make a ham glaze (any kind you like!) and simmer until thickened. Once you’ve got the glaze nice and glaze-y, brush it on the ham before baking (I like to bake uncovered, but either way works), and then brush once again about 20 minutes before it’s done. It thickens into this beautiful crust on the outside of the baked ham. Yum! All you have to do is simmer together the preserves, white vinegar (any kind will do, apple cider vinegar would be good! ), garlic, and some chopped up chipotle peppers. You almost never need an entire can of chipotle peppers (or at least I don’t!) You’re usually only using one or two. So I always package the rest up in a ziplock and save them for later. I pulled out the peppers I needed for today’s baked ham from the freezer, just chopped them up from frozen and tossed it in the pot. Easy peasy. 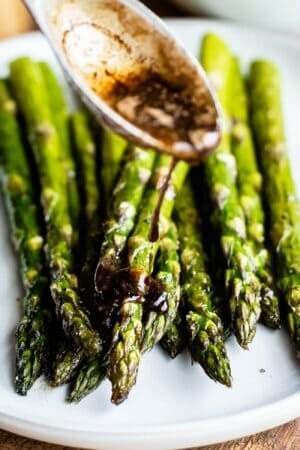 Balsamic Browned Butter Asparagus or maybe this Pineapple Spinach Salad? Both?? For dessert>>> Strawberry Pineapple Meringue Cake. Or maybe this Rhubarb Custard Pie. Or maybe these Rhubarb Meringue Layers?? Maybe all three??? Whatever you make, I hope you and your family have a lovely Easter!! I’m hoping to be back here later this week to get you one more recipe before Sunday, so stay tuned! 5 years ago: Creamy Strawberry Banana Jello << everyone needs jello on Easter, right?? 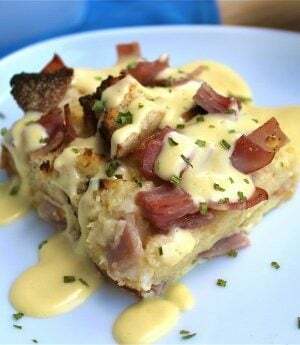 This is my favorite baked ham recipe! 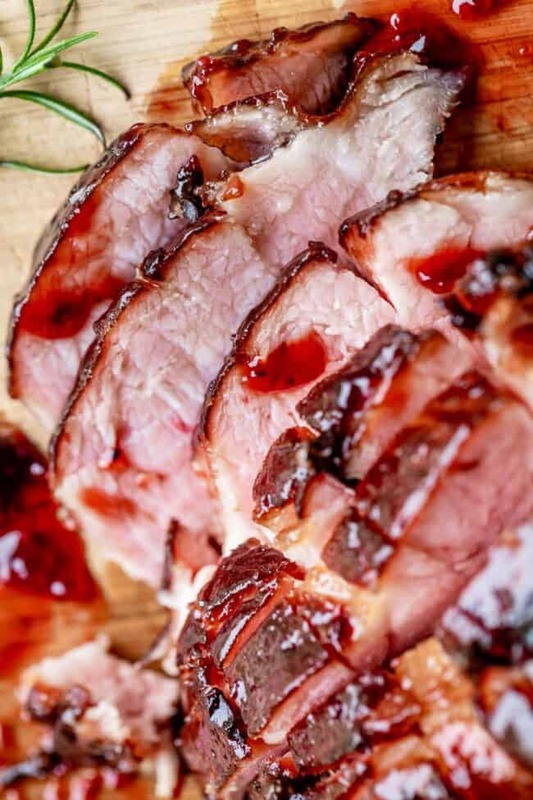 It's so easy to put together, and the Raspberry Chipotle Ham Glaze (made with raspberry preserves) is the perfect combo of sweet and tart, with a bit of a smokey kick from the chipotle. It not only makes a super juicy, tender ham, but the leftovers are AMAZING when added to soup or a pot of beans. Cook and stir over medium high heat just until boiling. Reduce heat to medium and bring to a simmer. Cook, uncovered, about 10 minutes more. It will start to thicken up. 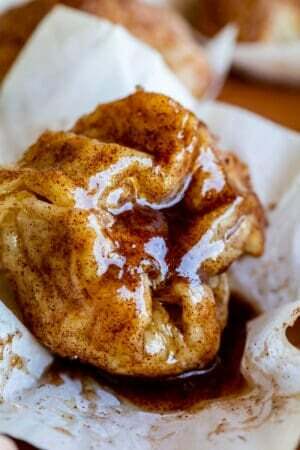 (You will have about 1 and 1/2 cups glaze.) Set aside. Set a rack inside of a large roasting pan. If you don't have a roasting pan, set a large oven-safe cooling rack over a half baking sheet with raised edges. You want to keep the ham lifted from the liquids that will pool in the pan. Cut open the packaging on your ham and throw away the glaze packet than probably came with it. We have loftier plans for this ham. Set your ham flat side down on the rack. Use a sharp serrated knife to score the ham by making diagonal cuts in a diamond pattern. See photos. Make the cuts about a half inch deep. If you want, stud your ham with cloves. Push one clove into the crosses of the diamond cuts you made. I love the earthy undertones cloves add! But it's totally up to you and it will still be a great ham if you skip the cloves. I've done it both ways. 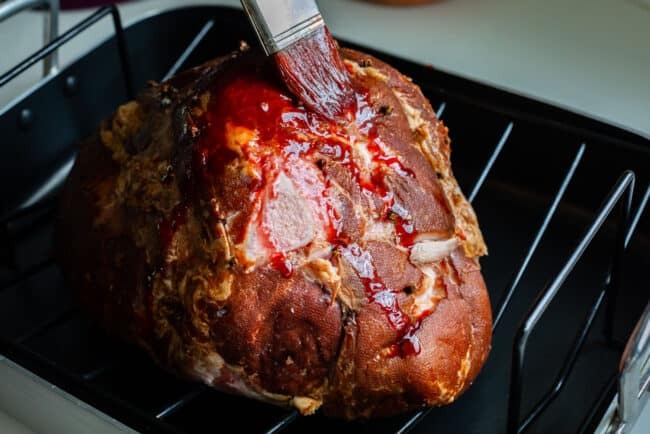 Brush the ham generously with the glaze you made. Don't use all of it, we need to brush again later too. Bake in a 325 degree oven for 1 and 1/2 to 2 and 1/4 hours or until thermometer registers 135 degrees F. (About 20-25 minutes per pound). Remember, the ham is pre-cooked, so you are just getting it nice and warm for serving, and crisping up the outside. About 20 minutes before your ham is going to be done, remove it from the oven and brush with more glaze. Return to the oven. When the ham reaches 135 degrees, remove from the oven and cover with foil until ready to serve. Serve with remaining glaze. Use your leftover ham bone to make Split Pea Soup! The chipotle flavor from the ham slays in this soup! Source: I found this baked ham recipe years ago in Better Homes and Gardens! It's been my favorite ever since! More Easter main dishes you will enjoy! 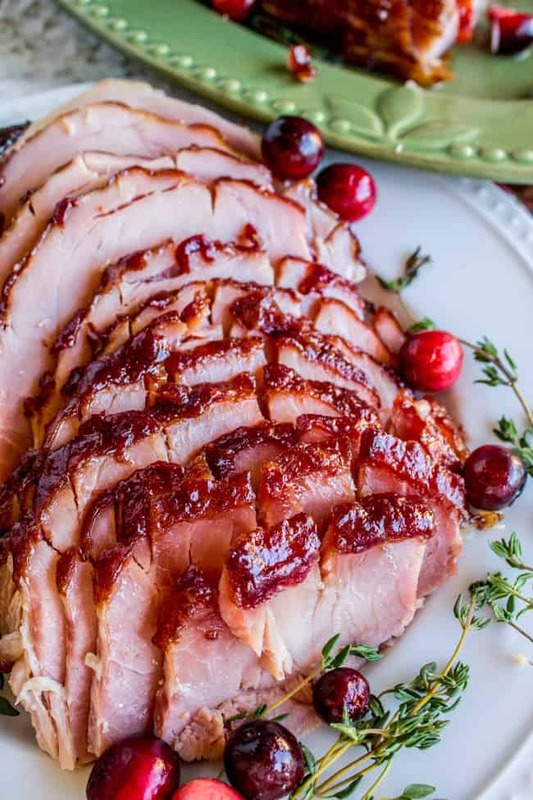 Oven Roasted Cranberry Dijon Ham << this is my other favorite ham recipe! It’s delicious! 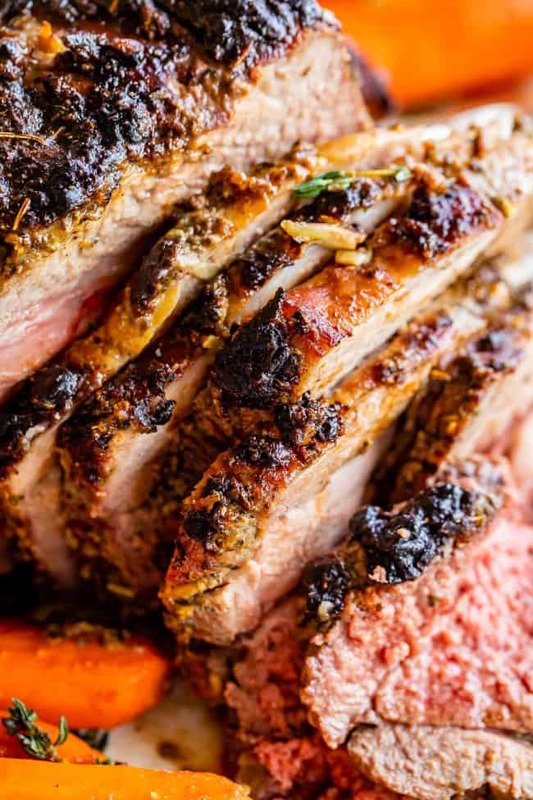 Roast Leg of Lamb with Blackened Honey Dijon Crust << if you are not feeling the ham this year, make lamb!! It’s so good. 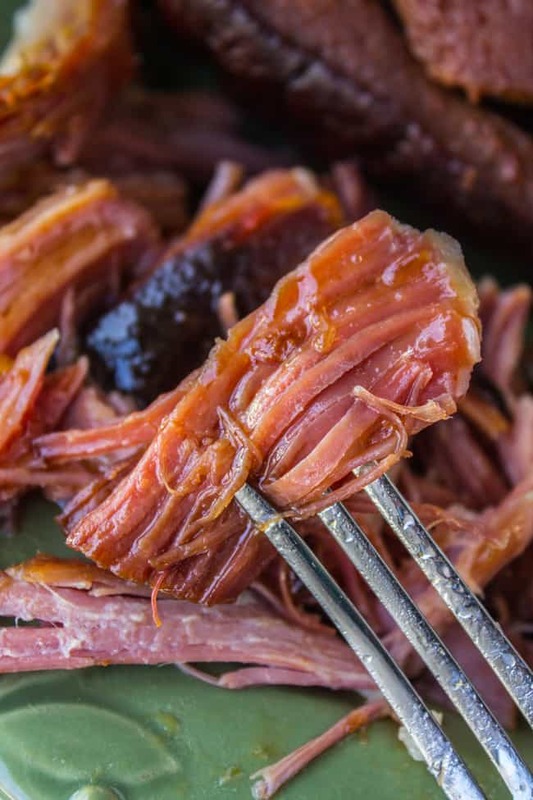 Easy Sriracha Ham (Slow Cooker) << this recipe only has 3 ingredients, and it’s delicious! This recipe uses the traditional brown sugar, but the sriracha totally changes the flavor profile. 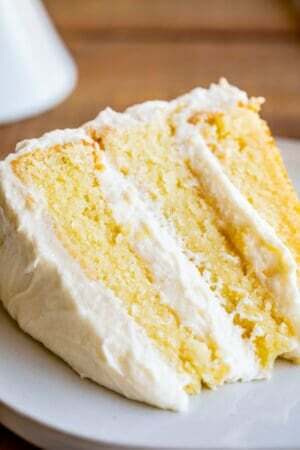 More Easter recipes you are going to love! That ham is GORGEOUS!! 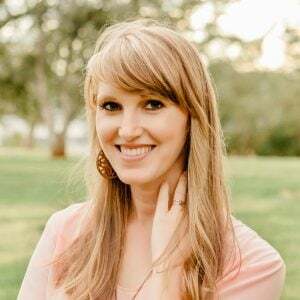 — Thank you so much for the egg salad feature! I’ve done this one before, and also love the cranberry one, but I also love making the rum and raisin sauce for ham. Run raisin sounds really good!! Can you use apple cider vinegar since it is such a small amount? Absolutely Mandy! That would taste delicious! We made this for dinner tonight and Cody loved it! So did I! We each ate seconds and slathered (what a great word!) our ham with the sauce. Yumo. Yeah isn’t it so good?? I’m glad you loved it! I made this recipe almost 7 years before my husband and I got married for a Christmas eve family dinner. Needless to say,it’s the one page I lost in my cookbook! Thank you for having it! Glad to help out! It seriously is the best ham recipe ever. This picture makes me want to eat meat — I have always loved ham, but this looks exceptionally delicious! I’m with you, Snarkie. (Can I call you Snarkie?) Carnivore to the core. This stuff will not disappoint. Of course you can call me Snarkie :)! Also, ham is one of the few meats I always want. I will go on phases where I don’t eat meat for months at a time. Inevitable, ham and cheese eggs will always draw me back in!